Orangutan babies Gondar, Tegar, Kartini and Gerhana have a new subject on their school timetable: Climbing in Borneo's rainforest. These four, who range in age from 16 months to 2 years, are the youngest of eight orphaned apes. And despite their latest skill, they still have a lot to learn at the FOUR PAWS ORANGUTAN FOREST SCHOOL in East Kalimantan before they can be released back into the wild. Physically, orangutans are perfectly capable of living in the treetops of the rainforest, but their climbing skills are not innate. They need to learn this and practice it intensively. Normally, orangutan babies learn survival skills such as climbing, foraging and nest-building from and with their mothers. But Gondar, Tegar, Kartini and Gerhana are growing up without these natural role models after having witnessed their cruel killing. To enable them to develop into well-adjusted adult orangutans despite this sad past, the four attend forest school. In the care of their human surrogate mothers, they have begun to practice climbing and searching for food in the more than 25-metre-high tropical trees. Firstly, however, their surrogate mothers had to learn how to climb trees safely. Therefore, the American organisation Tree Monkey Project sent a team of professional climbers to train the animal caretakers to climb the tropical trees — equipped with ropes, harnesses and helmets. 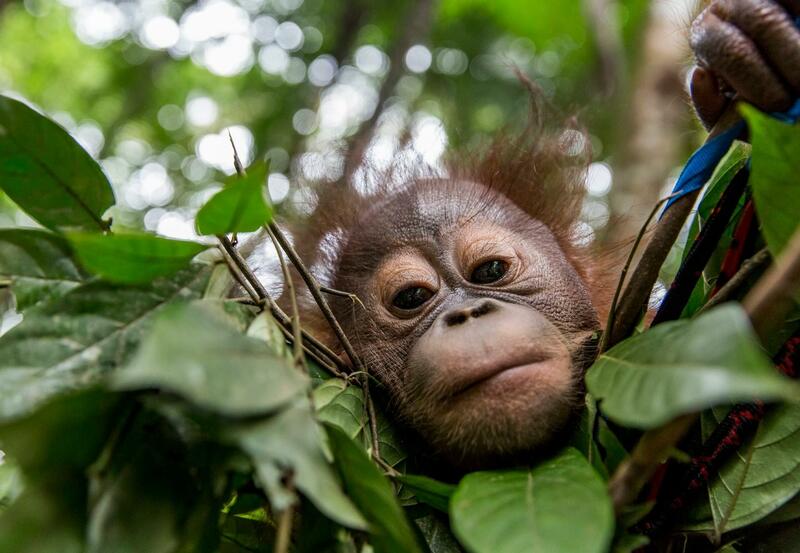 "One of our guiding principles at the FOREST SCHOOL is that we don't humanise the orangutans, but orangutanise the humans," explains Dr. Signe Preuschoft, primatologist and project manager at the international animal welfare organisation FOUR PAWS. "This means we don't bring the orangutan orphans down to the ground, we send the humans up into the trees." The climbing lessons for the forest students started last week. For the first time Gondar, Tegar, Kartini and Gerhana climbed up to the treetops together with their surrogate mothers. All four orangutan babies were willing to learn and curious, but at the same time irritated by the climbing gear of their surrogate mothers and were somewhat hesitant as a result. „Orangutans sometimes climb up and can’t make their way down, like cats," says Dr. Preuschoft. "They climb high into the tree, can’t climb down and start crying. Last year, this happened to Gonda, who was barely one year old at the time. He had climbed up a tree, too high for us to get to him, and then he didn't dare to come down again. His surrogate mother had to talk to him from the ground and encourage him for a very long time until he had the courage to climb down again on his own. That was a thoroughly dramatic experience that he has still not forgotten." Strictly speaking, Dr. Signe Preuschoft and her team teach orangutan orphans very little. "We do it more like orangutan mothers: We lead the way and are present while they explore different things. It is crucial that an orangutan child can always return to the safety of a maternal embrace. If the child trusts in this, it is very courageous and curious," says Dr. Preuschoft. The primatologist is sure that her protégés will now spend more time in the trees because they no longer have to come to the ground to find shelter. Rehabiliation in the FOREST SCHOOL curriculum matches the natural child development (see chart). As babies, they first live in the loving care of their human surrogate mothers in the baby house and go to kindergarten. From the age of two at the latest, the toddlers attend the Forest School, where they learn to navigate full-grown tropical trees with lianas. As their competence increases, the orangutans become more adventurous and independent. By the time they reach puberty, they are ready to graduate from the so-called Forest Academy. The FOUR PAWS team decides on a case by case basis for each orangutan when the student is ready to be released into the wild. FOUR PAWS has been working to rehabilitate traumatised orangutan orphans in Borneo for over a decade. Following a re-organisation of local activities, FOUR PAWS opened the ORANGUTAN FOREST SCHOOL in East Kalimantan in May 2018. Here, Dr. Signe Preuschoft and an Indonesian team of 15 animal caretakers, a biologist and two veterinarians are currently looking after eight orangutan orphans aged between 16 months and 9 years and preparing them for release into the rainforest. It is financed by FOUR PAWS and is a cooperative project between FOUR PAWS, local partner Jejak Pulang, and the Indonesian Ministry of Environmen and Forestry, which provided the 100 ha of land for the forest school. Rainforest has been destroyed on a massive scale in Borneo over the last four decades. Thousands of orangutans have become victims of the palm oil, tropical timber and coal industries. Every year, between two and three thousand orangutans are killed either because they are considered harvest thieves by palm oil plantations or for their meat. Helpless orphans whose mothers were deliberately killed end up as pets. The Bornean orangutans are among the critically endangered species.